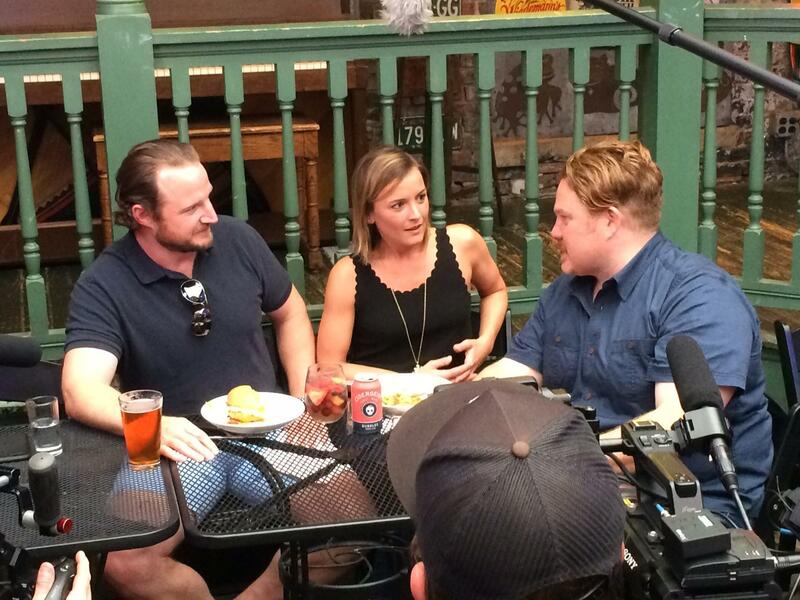 "Man v. Food" host Casey Webb talks with Jim Tarbell, former Arnold's Bar & Grill owner. 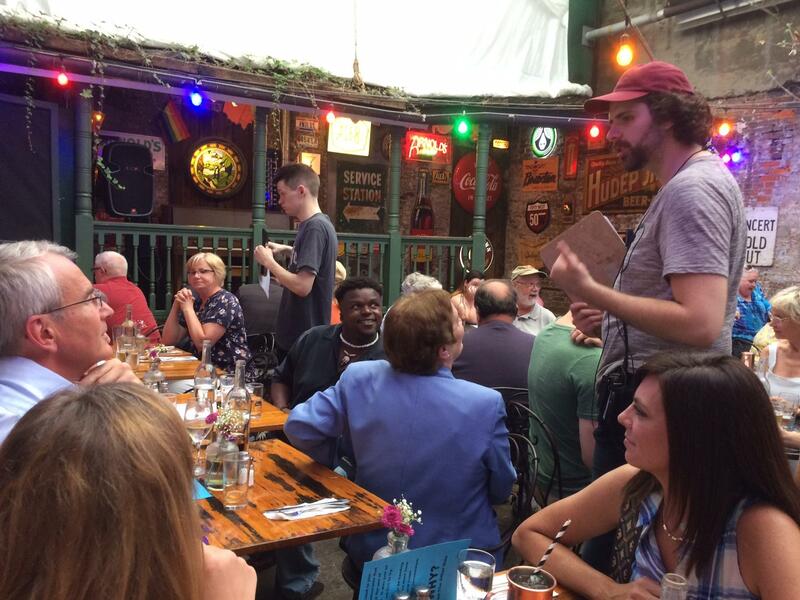 Webb, the New Jersey native who took over the show last year, chatted with patrons in the covered garden as they ate Arnold's signature Greek spaghetti, the restaurant's new pork belly sandwich or the Yo Mamma burger with goetta, hash browns and an over-easy egg. Casey Webb (right) talks with patrons Thursday night. "Man v. Food" will film Friday at Blue Ash Chili, 9565 Kenwood Road, Blue Ash. The shoot moves to Roc-A-Fellas pizza, 11055 Reading Road, Sharonville, Saturday morning and afternoon. Webb poses for a picture with customers. Crews arrived at 2 p.m. to film in the kitchen, said Chris Breeden, son of Arnold's owner Ronda Breeden. Webb appeared about 5:15 p.m. in the packed garden, and taped interviews with patrons at five different tables for nearly two hours. Webb's longest conversation was with Jim Tarbell, who bought the historic 1861 downtown tavern at 210 E. Eighth St. in 1976. He sold it to Breeden, a long-time employee. He told Webb how the location was once a barbershop, with a feed store next door. The bar was started by Simon Arnold, and his family operated it for three generations, according to the Arnoldsbarandgrill website. This will be the first time Arnold's will be featured in a national TV food show, although it has been seen in a couple of movies and the bar served as a model for a tavern on Kathy Bates' short-lived "Harry's Law" NBC drama (2011-2012). Producers asked customers to sign permission forms so they could appear in the television show. Blue Ash Chili was visited by Guy Fieri's "Diners, Drive-ins and Dives" in 2010. 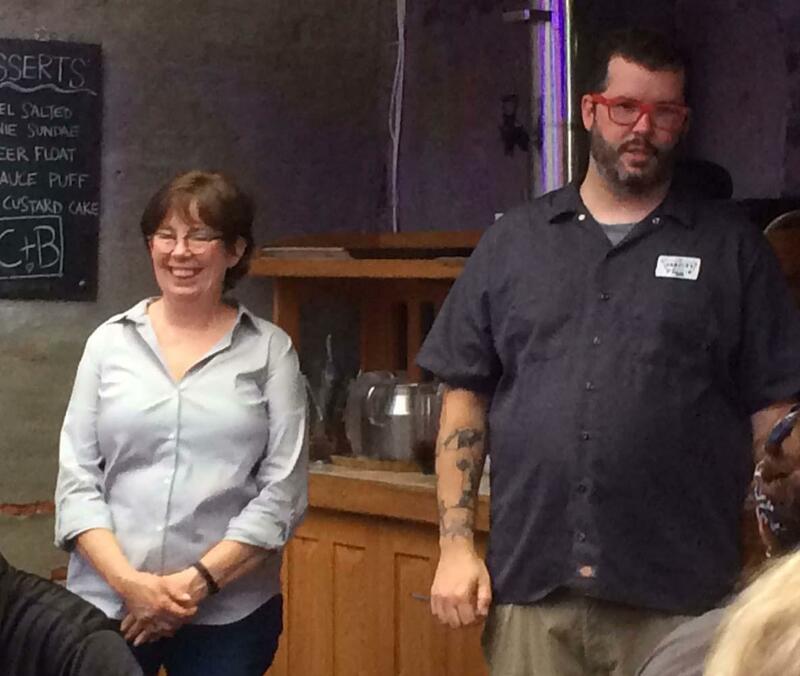 Owner Ronda Breeden and her son, Chris Breeden, watch the filming Thursday. 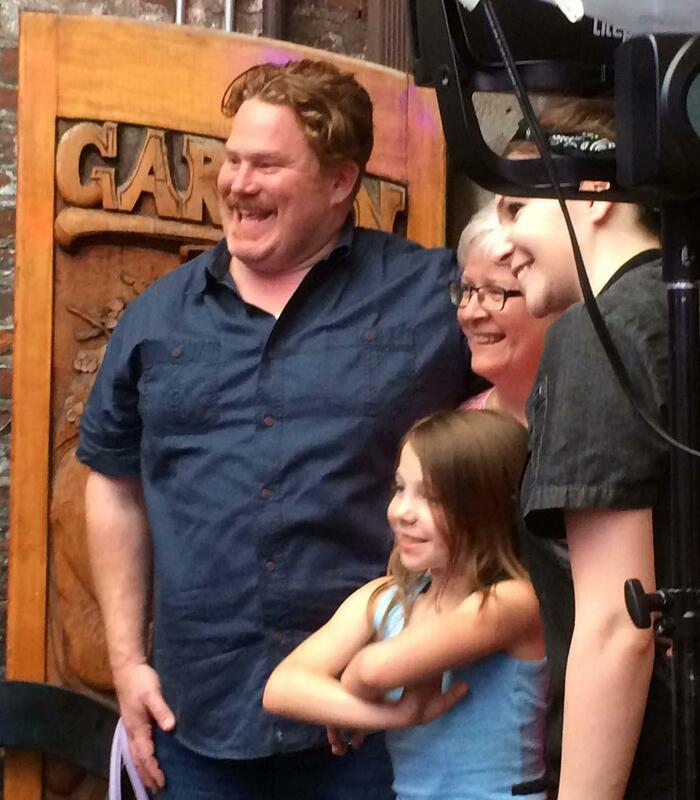 The Cincinnati "Man v. Food" episode is expected to air later this year. New episodes air at 9 p.m. Mondays on the Travel Channel. The show was revived last year after a five-year hiatus when original host Adam Richman (2008-2012) left. "Man v. Food" filmed here in 2011 with Richman, who visited Camp Washington Chili, Tom + Chee's, Findlay Market and at Izzy's on Main Street downtown. The show ended with a local baseball coach Adam Turer trying to eat the 110 Reuben, a five-pound sandwich consisting of a pound of corned beef, three pints of sauerkraut, dressing and Swiss cheese on an oval Rye loaf.